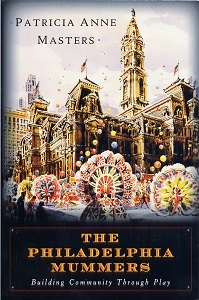 These two books, by E.A.Kennedy III and Patricia Anne Masters, are both about the Mummers Parade that takes place every New Year's Day in Philadelphia, Pennsylvania, USA. They approach the subject from two different angles, one pictorial and the other academic. 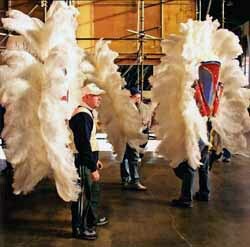 A fancy brigade rehearsal wearing backpieces. The Mummers belong specifically to South Philadelphia, the district around South 2nd Street known as "Two Street" or "Mummers Row", where the Mummers' club houses are situated. The Parade up Broad Street to City Hall and the associated competitions are renowned for the elaborate colourful costumes, dance routines and antics. The custom emerged from several European immigrant traditions - mainly Irish, Swedish and German, plus a dash of African-American. The competitions are split into five 'divisions'. The Comics are regarded as the closest to the traditional Mummers. They dress as clowns, wenches and other whimsical characters, and may perform short topical skits. Wench Brigades are a recent offshoot of the Comics, large groups of guys in dresses, bonnets and bloomers, and carrying parasols. The String Bands are the musical highlight of the parade, playing a variety of instruments. The Mummers' theme song is "Oh, Dem Golden Slippers". The Fancies have the most elaborate costumes and floats with massive back pieces. In fact the costumes can be so large that they are rolled along on castors. The Fancy Brigades spun off from the Fancies in 1978. They are noted for their props and precision choreography. E.A.Kennedy III is a respected editorial photographer, and as documenter of traditions he deserves to stand alongside the likes of Brian Shuel and Doc Rowe. Following a chance encounter, he "embedded" himself with the Mumming community over a four year period in the mid 2000s, visiting their clubhouses and getting to know their families. This is a visually appealing book, a photodocumentary with over 150 striking colour photographs. The text, however, is equally interesting. The introduction gives a good general overview of the custom and its history, and outlines some of the social tensions that have surrounded it over the years. He goes on to talk about each of the five parade divisions. In the chapter entitled "Pursuit of Happiness", which occupies two thirds of the book, Kennedy gives an eclectic selection of photographs showing the Mummers socialising in their clubhouses, rehearsing and making costumes, and of course parading on New Year's Day. The captions are informative and include interesting facts about the participants. There is page of sources for further reading, but no index. An index would have been handy for the names of people and brigades. Patricia Masters is a professor of Sociology and Anthropology, so unsurprisingly this is an academic book looking at the South Philadelphia mumming community from the points of view of social history and anthropological analysis. It is based on her PhD thesis, which entailed over five years of field research in the late 1990s, when there were only four divisions. During this time she "went native" by joining the Golden Crown Fancy Brigade. She notes a hierarchy of mumming allegiances - neighbourhood - divisions - clubs - families - each important for socialising and play. 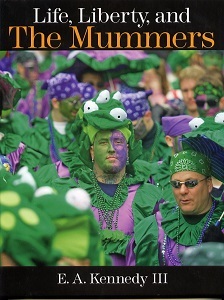 She also explores the Mummers' four main motivations - fun, keeping up the tradition, friendship, and creativity. There have always been tensions between South Philadelphia and the rest of the city and suburbs. Mummers were outlawed as a common nuisance during the first half of 19th century, although the custom continued anyway. Prompted by celebrations for turn of the century, the city authorities formalised Mummers Parade in 1900, hoping to tame the festivities which had tended to get out of hand. The introduction of the competitions and their rules generally had the desired effect. Philadelphia Mumming is principally a white male activity, but there has always been some black participation. In fact African-Americans even had their own mumming clubs until the mid-20th century, when the Great Depression caused them to drop off. Women, on the other hand, were excluded from the parade, instead being consigned to back room supporting roles, notably costume making and fund raising. However, from the mid-1970s, they started to participate in the parade. At first this was in a low key way as musicians, but later some women only brigades were formed. An appendix gives Masters' research methodology, and there is an extensive bibliography and index. Unfortunately, there are only a few illustrations, and those are black and white. They are not really sufficient to do justice to this colourful tradition. These books nicely complement each other, a good example being their respective discussions of the blackface controversy of the 1960s. Certain Mummers divisions used to black up their faces in the style of the minstrel shows. Concerns were raised about this in the 1950s, but it became a hot potato in the 1960s with the growth of black consciousness. The City responded by banning blackface, but some mummers resisted, and the matter became a big issue in local politics to the point of physical confrontation. Kennedy discusses the dispute from the perspective of an African-American whilst also acknowledging the Mummers' point of view. Masters meanwhile provides more information, including statements and opinions from people on both sides of the controversy. Many of the arguments will sound familiar to people engaged in the current debate on the use of blackface in the UK (although most British blackface is used for disguise rather than a racial portrayal). Interestingly, both authors seem to agree that a lot of the aggro arose from outsiders not understanding the nature of the South Philadelphia tradition, and from the heavy handedness of City Hall. Kennedy's book gives an excellent general overview of the Philadelphia Mumming tradition and the impressive photographs give a superb insight into the Mummers' sense of community and communal pride. Anyone tempted to say it is just a coffee table book would be seriously underselling it. On the other hand, Masters' book is essential reading for anyone seeking an in depth study of the Philadelphia tradition and will be of interest to sociologists generally. It adds flesh to the bones of Kennedy's photodocumentary. In the context of these two PMP books it might be worth mentioning the relatively recent "Along Their Merry Way: How the Mummers Got Their Start and Strutted into Philadelphia History" by Suzanne J.HANSBERRY. TimeOut Press. (2000) soft case, 221pp.